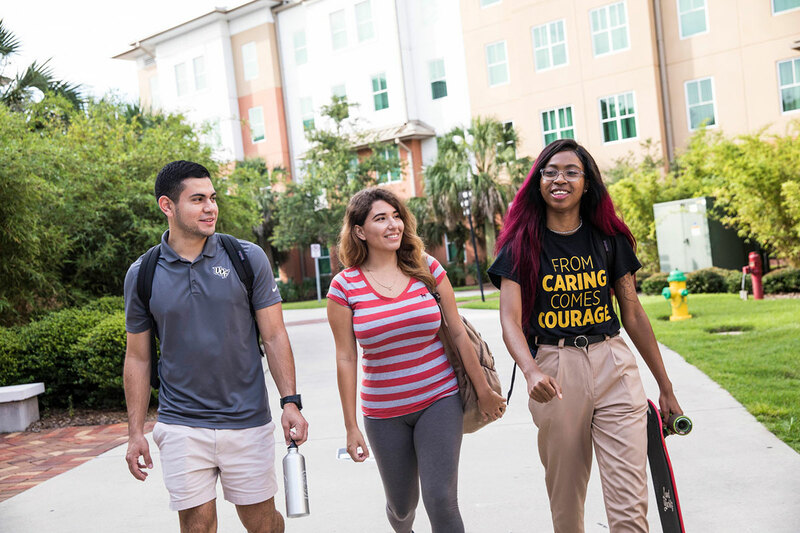 UCF turns the page Monday to its second half-century with what is projected to be its most accomplished incoming class, new offices and classrooms in just-completed Trevor Colbourn Hall, several new degree programs and a new quiet-zone study area in the library. Registrations are still being taken, but as of today UCF expects to welcome a total of 67,500* students. The first-year students are even stronger across the board than last year, which had set the record for the most accomplished in the university’s history. This year’s class GPA bested last year (a jump from 4.06 to 4.11), SAT average score (from 1316 to 1328), and ACT (28.1 to 28.3). The total number of National Merit Scholars is projected to be 82 this year, boosting the National Merit enrollment to 316, the largest ever at the university. In addition to undergraduate students, an anticipated 9,750* graduate students are seeking master’s and doctoral degrees, a growth of nearly 6 percent. Part of the university’s enrollment is fueled by the growth in offerings to UCF Online students. Enrollment for strictly online students jumped 50 percent this year to about 4,300*. The university now offers 216 degree programs, including a bachelor’s degree in emergency management and a master’s degree in emergency and crisis management. Two doctoral programs also were started for big data analytics and integrative anthropological sciences. All these numbers reflect what has happened in the university’s first half-century, since the then-named Florida Technological University opened for classes in 1968 with seven buildings, an enrollment of 1,948 students and 55 bachelor’s degree programs. The makeup of the university enrollment also shows that minority students are approaching 50 percent, Hispanic students are 25 percent, and 25 percent of the students are the first in their families to attend college. Trevor Colbourn Hall on the central west side of campus is a 21st-century learning space of classrooms, study areas and offices. The 136,786-square-foot building opened the first week of August and includes space for 24 departments from the College of Arts and Humanities, College of Undergraduate Studies, Burnett Honors College, and Student Development and Enrollment Services. The building replaces the soon-to-be-demolished Colbourn Hall, one of the oldest buildings on campus. As part of an updating project of the John C. Hitt Library—among the first buildings on campus—a new quiet study room opens today on the fifth floor. There are 174 seats all within reach of a power outlet to recharge electronic devices. Elsewhere in the library, an automated retrieval center is being added that will have a capacity to find and deliver books from among 1.25 million volumes. That project will be completed in the coming months. Transferring books into the retrieval center will free up space for up to 1,300 additional user seats in the library. *Student counts are preliminary. Final numbers will be available later this fall.